Read about the Siteshelter, a high quality and cost-effective shelter for securely storing gear and product. Situated in the peaceful countryside of Maramarua, Ferndale Farms specialises in the haulage of aggregates and forestry products throughout the North Island. And when it comes to storing product such as agricultural lime, it’s important that it’s kept perfectly dry. With the business expanding, the time came to build a new shelter to store product. "We were looking for something high quality and cost-effective, but we also needed to get the job quickly," says managing director Derek Tremewan. After checking out a few options, Tremewan came across Siteshelter. "Not only were they incredibly cost-effective, they were also able to get the job done quickly. In fact the whole process was incredibly easy." Manufactured in New Zealand, Siteshelter’s high quality, certified design meets our strict building codes. Each shelter is designed for your site location and comes with a ten-year written warranty. The shelters range from six metres to 14 metres in width and can be as long as you like. 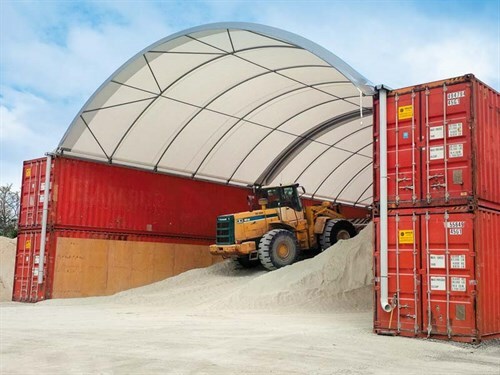 To keep Ferndale Farms’ aggregate lime undercover and in tip-top condition, a container shelter was the perfect solution. Measuring 14 metres wide and just over 24 metres long, stacked containers were used to form the subframe and walls. One of the extra benefits of a container shelter is that the containers also double as a lockable storage area. They’re a great solution for businesses that need a workshop or service bay area, machinery storage, or somewhere to lock away dangerous goods. The containers can also have windows and doors added for extra convenience. The installation team used a fast mount beam system which is designed to save time installing. So rather than welding each arch frame in place which requires accuracy and takes a lot of time, it’s simply a case of locating the beams on the containers and connecting the frames to pre-welded mounting spigots. "We’re really happy with the result," says Tremewan. "In fact we’re so pleased with the shelter that we’ve decided to have another installed very soon." Siteshelter uses a high strength Tuffspan fabric for all roof covers and end walls. Some people think that fabric thickness and weight is an indication of its quality. This is a myth! A heavy fabric that isn’t fit for purpose will wear out quickly. The Tuffspan Fabric used by Siteshelter features world class leading UV Stabilisation, exceptional strength and retained tension, and has been used by Siteshelter for over 30 years in New Zealand and Australia.While weighing less than PVC fabric, the unique strength, tension and longevity properties of PE make it the number one choice for the majority of the world’s fabric structure manufacturers. Installing the shelter took just less than a week and was simple and straightforward. "The team that put the shelter together were fantastic," says Tremewan. "They just got on and got it done without any hassles." Looking for fill? Then you’re looking for Look4Fill.